Despite rumors to the contrary they are not just the figment of movie nerd’s “Napoleone Dynamite”. They are a real hybrid consisting of a female lion and a male tiger. Terri Werner and I interviewed “Doc” Antle of the T.I.G.E.R.S. Preserve in Myrtle Beach, SC about ligers and had the opportunity see them in person at his facility. 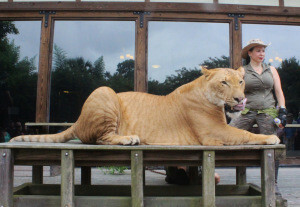 A liger at the T.I.G.E.R.S. facility in Myrtle Beach, SC.